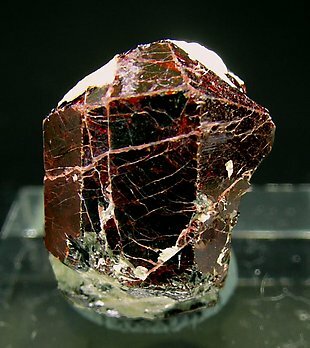 Doubly terminated and complete in all sides, gemmy red (when viewed with strong light from the rear), Rutile. Its elongated form is pretty unusual as well. 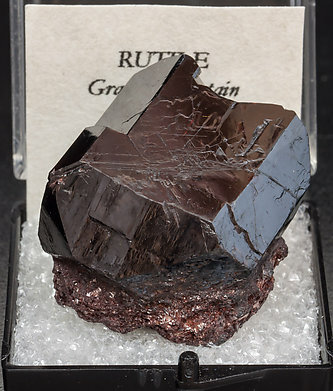 This kind of Rutile is no longer present on the market. Prismatic crystal with very well-defined faces and edges. It has translucent reddish zones. The crystal is partially covered by matrix. Prismatic crystal with very well defined faces and edges. It is sharp, bright and dark brown. A Classic Specimen. Good sized Rutile crystal with well defined faces and a very marked and classic twin. Faces show a very good luster, with deep reddish reflections. At the base and at the top and back side we can see a small Muscovite rich matrix. Multiple “elbow” Rutile twin. It is bright, has very well defined faces and edges, a fine growth striation and it has a reddish color. The sample is from a not widely reported Brazilian locality but that is well known for its complex Rutile twins. 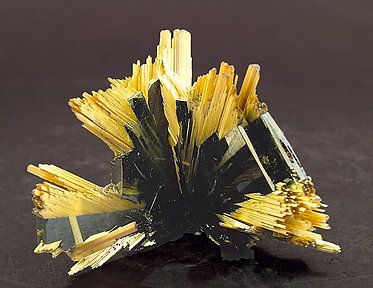 The crystals of Rutile, which are brilliant yellow and have golden reflections, have grown epitaxially on tabular Hematite. 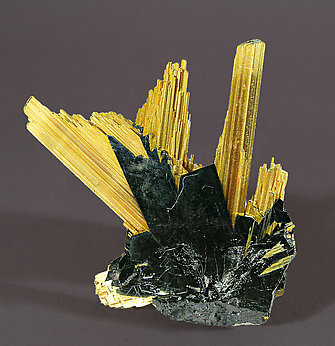 The terminations of the Rutile have very well defined faces, which is not so common with this type of specimen. 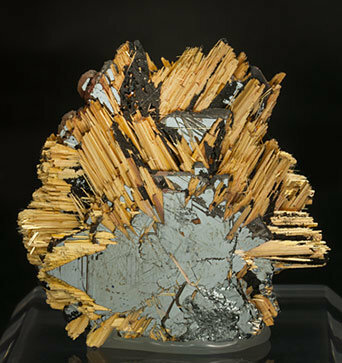 The specimen's photo has been reviewed and published in the magazine ‘Rocks & Minerals’ on page 174 in the volume 85, number 2. 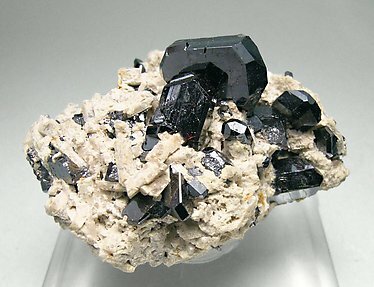 Thick, very brilliant, and perfect crystals of Hematite that formed as a floater and that has a re-crystallized base. 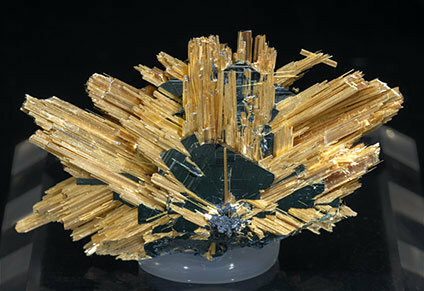 The Rutile is growing in the typical orientation on its faces. A really luminous specimen. 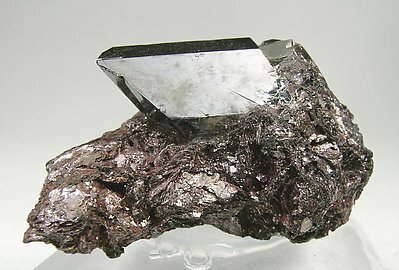 Large, thick Rutile crystals oriented with the Hematite. This is a really beautiful floater. 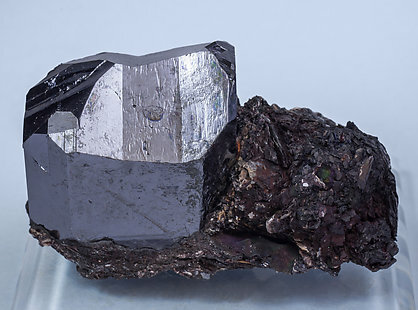 Two crystals of Hematite, as well as some other smaller ones, that form the base for the growth of fine epitaxial prisms of Rutile, which are perfect defined and terminated and have the 60º angles between them that are dictated by the Hematite. 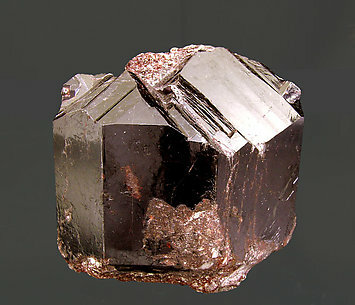 Epitaxial growth of red brilliant twinned Rutile on a doubly tabular former Ilmenite crystal pseudomorphed by Rutile and Hematite. 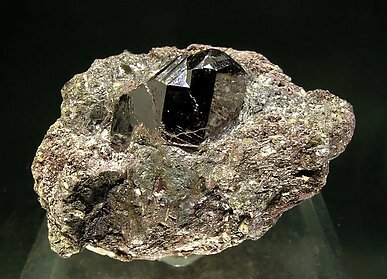 This specimen was published on the Mineralogical Record´s web page, in the ‘What's New’ section of the January 18, 2008 edition. 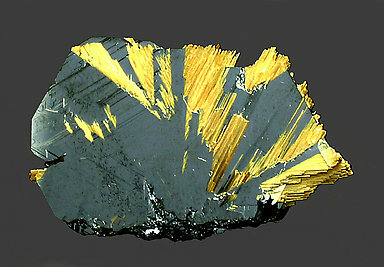 Epitaxial Rutile reticulated growth on a tabular former Ilmenite crystal pseudomorphed by Rutile and Hematite. 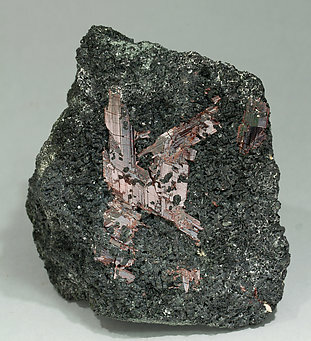 Epitaxial growth of red brilliant twinned Rutile on a tabular former Ilmenite crystal pseudomorphed by Rutile and Hematite. 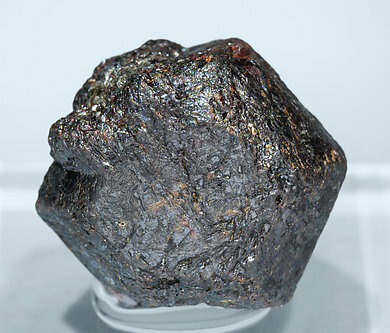 The former Ilmenite is showing well-marked geometrical forms. The specimen's photo has been reviewed and published in the magazine ‘Rocks & Minerals’ on page 174 in the volume 85, number 2 , in the magazine ‘Le Règne Minéral’ number 97, page 42, and in the magazine ‘extraLAPIS’ on page 49, number 43, "Pseudomorphosen". I have never seen other Rutiles like this one. I do not know if other similar specimens exist, but I guess that if they do they would be from a "once and only" find. 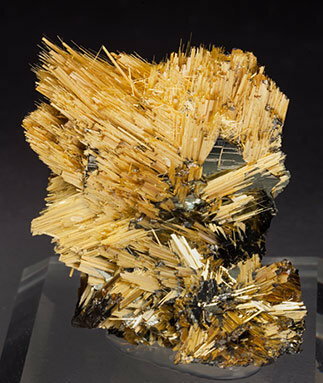 Everything about it is distinct; not just the form of the Rutile crystal but also the termination; and then on top of that the rather rare orange Calcite that hosts it. Multiple twin of very sharp prismatic crystals. 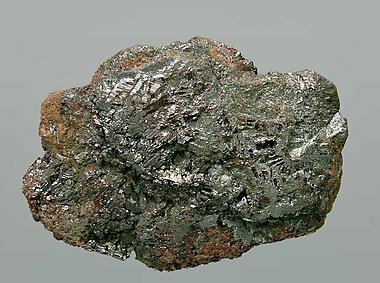 They are red, have an intense luster and are on a chloritic matrix. The sample is of great quality for the locality, relatively unknown for most collectors. 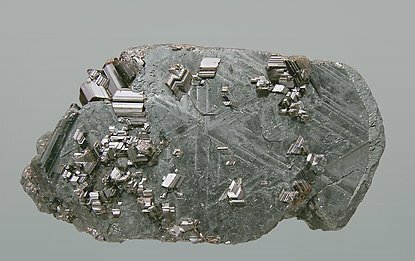 Epitaxial overgrowths of needlelike rutile crystals on platy Hematite crystals. 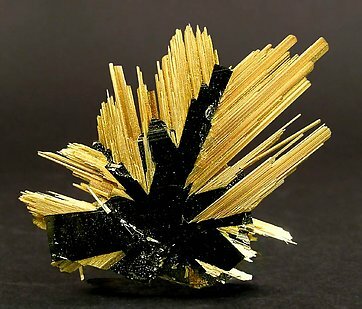 They have a yellow color with golden reflections, are very bright and have grown oriented in the shape of starbursts following the structure of the tabular Hematite crystal. 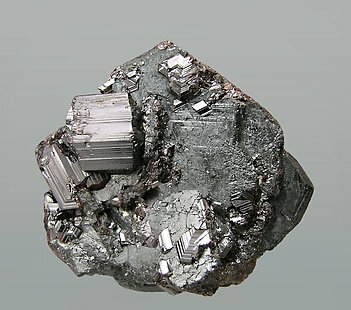 Epitaxial growths on platy Hematite crystals of thin Rutile crystals with finely striated prismatic faces and good terminations. They have a golden color and are very bright. The sample is from the first finds of this type of Rutile from the locality. Acicular crystals of Rutile with good terminations, very bright with a golden yellow color. 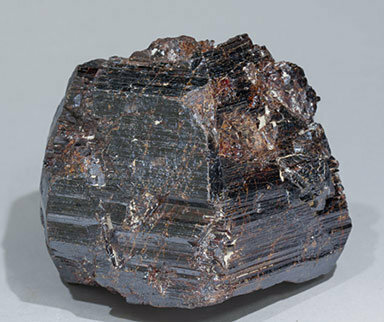 The crystals of Rutile have grown epitactically on laminar crystals of Hematite with a very sharp hexagonal contour. 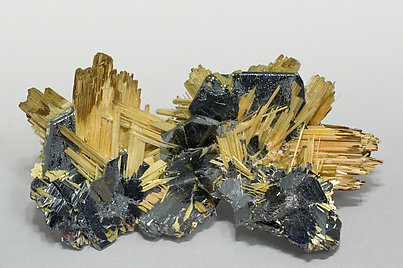 Twinned Rutile crystal with very well defined faces and edges. The surface of the faces is very bright with intense red reflections. On the base and partially on the back and the top there is a small matrix of Pyrophyllite. 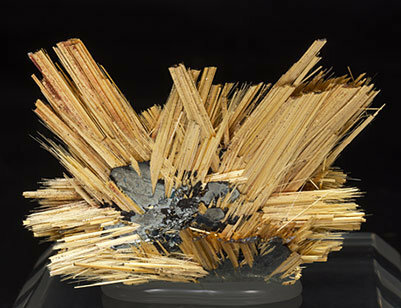 Twinned Rutile crystal with very well defined faces and edges, an excellent luster and implanted on a matrix of a laminar Pyrophyllite aggregate. An excellent sample, a classic both for the species and for the locality. We’ll send to the buyer, with the sample, the original commercial label of “Aesthetics Underground” from Canada from the Rob Woodside collection. 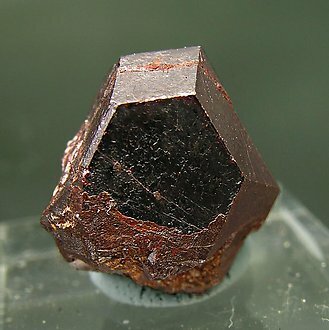 A well defined and aerial crystal with very sharp faces and edges, showing reddish reflections. 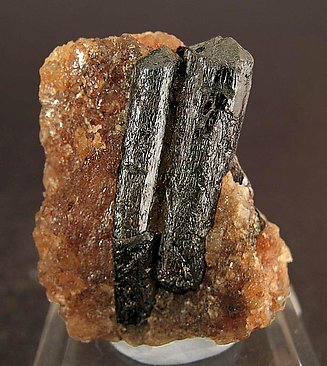 This specimen shows the typical Rutile twin. Well positioned on a Pyrophyllite matrix. Very sharp crystal, twinned, unusually acute for a sample from Graves Mountains. It is very bright and it is on matrix. Doubly terminated crystals that have very well defined faces and edges. The crystals consist of a single prism and two terminal dipyramids twisted 90º degrees to each other. They are very bright and are on Quartz matrix. We note that the pieces from this locality are practically, nowadays, not available in the market. Complete and floater cyclic (sixling) twin with relatively well defined faces and edges. An excellent Spanish classic from the Type locality for the species.